We would like to take the opportunity to recognize and celebrate the contributions from our faculty and staff that have been made throughout this momentous year. Lisa Campbell, Shannon Ferrell, Erik Moortgat, Debra Stark, and Hongbin Zhan are celebrating 20 years of service in the college. Laura Caldwell, Patrick Edwards, Lee Linwood, Robert Mitchell, John Nielsen-Gammon, Alex Orsi, Richard Orville, Lisa Reichert, and Niall Slowey are celebrating 25 years. And finally, Gudelia Delgado, Jerry North, and Edward Webb are celebrating 30 years. The 2016 Distinguished Achievement College-Level Teaching Award recipients are Anita Rapp, Assistant Professor in Geology & Geophysics, and Mary Jo Richardson, Regent’s Professor in Oceanography and Geology & Geophysics. The award was started in 1982 by the Association of Former Students in which they fund awards to honor faculty members who demonstrate unwavering dedication to teaching. “Where Anita especially excels is that she is capable of walking that teaching fine line: she clearly shows she cares about students and bonds with them in a shared academic experience, yet she does not compromise on rigor or expectations… it is when students respect and admire a teacher that obviously holds them to high standards that you are witnessing a superior college classroom educator,” said Don Conlee, Instructional Professor in Atmospheric Sciences. “Dr. Richardson is one of the true heroes of our university and generations of Aggies have benefited and continue to benefit from her tireless efforts to enhance the student experience at TAMU. Her body of work speaks for itself, and it is impossible to highlight all that she gives to her students and colleagues,” added Debbie Thomas, Interim Dean. Thank you for your dedication and hard work! 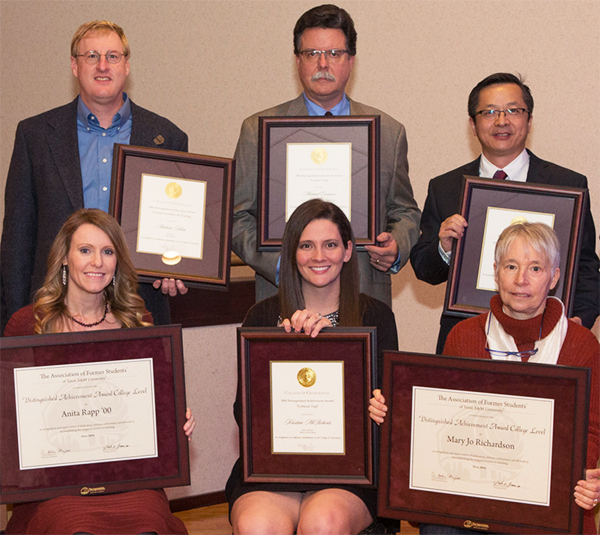 Congratulations to our award winners: Andrew Klein, Michael Cannon, Hongbin Zhan, Anita Rapp, Kristine McRoberts, and Mary Jo Richardson.